By any standards, the restructuring of Hearts - from a business and football perspective - appears to have been a success. While Ann Budge has overhauled the way in which the club is run, Craig Levein has revamped the football set-up, with Hearts' healthy lead at the top of the Championship the most obvious gauge of success on that front. This has been achieved with the minimum of fuss, with Levein staying out of the spotlight and the man he appointed as head coach - Robbie Neilson - dampening any hint of hyperbole surrounding their title challenge. It's a mindset he has urged his players to adopt too and so when Genero Zeefuik - just in the door - handed journalists a headline on a plate this week, Neilson would have been pulling his ample mane out. The Dutchman's claim that victory over Rangers would mean the league title was in the bag will not be repeated on Neilson's watch. His own appointment was one of a number of difficult and controversial decisions taken in May by Levein, who discarded the popular Gary Locke and several experienced players who'd taken wage cuts to help Hearts through administration. 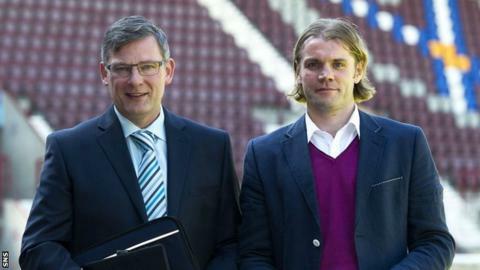 There was a furore at the time, but eight months down the line, Hearts are in rude health, it seems, though still Neilson won't be coaxed into accepting publicly that Levein has been vindicated. "I'll tell you at the end of the season, if we go up. That was the ultimate aim - to get promoted," he said. "We're certainly in a good position at the moment. If we get up, it was a good decision. "I feel it's going ok so far, there's still an awful lot of room for improvement, a lot of hard work to get done. I think we're on the right track." That's as close to getting carried away as the understated, quietly spoken Neilson gets. The work ethic is a key principle at Hearts, with Neilson having implemented a training schedule that incorporates two and sometimes three sessions a day. Players have responded well, with Morgaro Gomis the latest to admit he's fitter than he's ever been as a result of the new regime. That is a Neilson initiative, but Levein oversees everything, from the football academy upwards. "He's set a process with guys who want to work hard, do well and want to progress the club. His influence is all over the club," added Neilson. "That ethos he brought in, he started to do it at Dundee United before he took the Scotland job. I think it's something he's been planning a long time and he's definitely implemented it well." Levein's reputation took a battering as the Scotland manager, but his work at Hearts has begun to repair that. His willingness to allow Neilson free rein over first-team matters has also won over some of the doubters. "He's going about his job quite meticulously, but behind the scenes, with Robbie being allowed to get on with his job. I was sceptical about it to begin with, I didn't really see how it would work, how it would merge, but it's worked very well," former Hearts captain Michael Stewart told BBC Scotland. "Craig takes credit for allowing Robbie the scope to get on with his job. "Ultimately, people in power live or die by their decisions and there's no doubt the coaching structure that's been put in place has been a roaring success. "Allowing Gary Locke and Billy Brown to go and promoting Robbie has been shown to be a wise decision." Stewart believes Neilson's attention to fine detail and ability to communicate that to his players is the single greatest difference. "When you watch a team, you can see within a couple of minutes whether the team's been coached thoroughly and the message is getting across, and since Robbie's taken over you can tell that's happened," he added. "Man-management skills and his communicative skills have clearly had a huge impact on the players individually and collectively." So, as the march towards the title continues, whisper it, but the signs are that the Hearts revolution is in good hands.